Thanks for visiting my website. 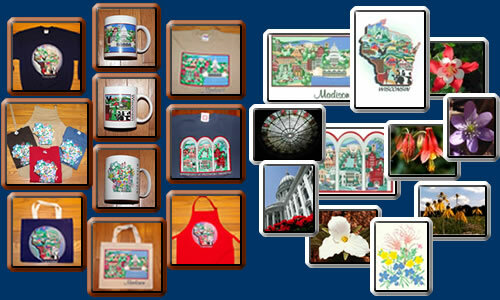 I hope you will browse the shirts, cards, photos, screen prints and other items - designs expressing my great love of Madison, Wisconsin and all kinds of plants. I'm now selling most things I make through Etsy. You will also find my designs on Society6, RedBubble and.FineArtAmerica If you see an item or design you would like that is not listed on Etsy, contact me. This site is now basically an archives of my earliest designs, as well as having information about my garden. Etsy tiles, mugs, coasters, throw blankets, wall tapestries, shower curtains, rugs, shirts. beanies and a lot more . . .
At Etsy, you are purchasing items directly from me, through Etsy, shipped by me. For a "virtual tour" of my garden, follow the "Gardens" tab - lots of photos to enjoy (you'll learn what a garden fanatic I am) but my plants and garden are not for sale! 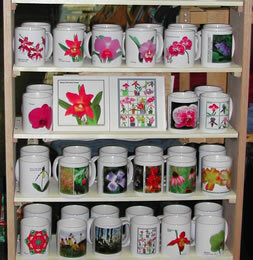 A multitude of mugs and tiles! WISCONSIN gifts MADISON gifts My first screen prints of this century! Visit my garden on 'The Wisconsin Gardener' on Wisconsin Public Television "a Madison garden that is colorful all season long and accessible to people of all abilities" Watch it now! What’s gone in to the gifts and gardens you see here? Lot’s of fun, satisfaction from accomplishment . . . and a lot of work! Generations of my family have loved this area - its landmarks, landscapes and its plants. I combine this love of place and plants in what I create – from shirts or cards featuring Madison landmarks to close up photos of favorite flowers. In the last 15 years I’ve developed an extensive garden in my yard – collecting different kinds of plants, seeing if I can have something interesting to look at in the garden all year, and taking LOTS of photographs. 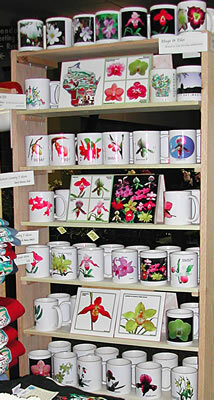 Now retired, I hope to spend more creative time – with graphic arts and gardens. 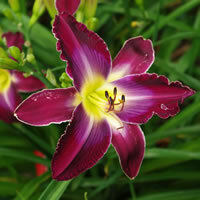 I hope you enjoy the “tour” of my garden here and that you find photos and information that intrigue or delight you!